Breaking down fat deposits and losing weight involve months or years of dedication and motivation, but the process is simple at its core; to lose weight, you need to get more activity and eat fewer calories than you burn. Taking a well-rounded approach to weight loss that involves both diet and exercise changes helps you keep lean muscle mass as you break down your fat stores, so you'll look toned when you reach your goal weight. The balance between the calories you eat and the calories you burn affects your body fat levels. If you eat as much as you burn, you'll get all the energy you need from your diet, so you'll neither store nor break down fat. If you're eating and drinking too many calories, they'll be converted to fat molecules and stored within your fat cells, boosting your overall fat levels. Eat and drink fewer calories than you burn, and you'll start breaking down your fat deposits for energy. A small calorie reduction -- from 250 to 500 calories each day -- is the best way to break down fat stores safely without harming your muscle tissue. Eating too few calories, in contrast, causes your body to break down muscle tissue and retain fat, which lowers your metabolism and makes it progressively harder to lose more weight. Use a calorie-needs calculator to get your approximate basal calorie burn, which is based on your body size, gender and age; then add the extra calories you burn through activities like exercise to get your total calorie burn for the day. From this number, subtract calories for weight loss; each pound of fat stores 3,500 calories, so cutting 250 to 500 calories each day will mean you lose a half-pound to one pound each week. Just keep your calorie intake above 1,200 calories daily for women and 1,800 for men to ensure you're breaking down mostly fat stores, not muscle. 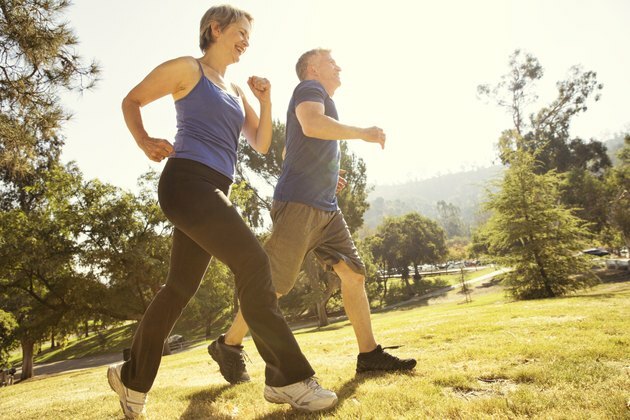 Introduce more activity into your daily routine to burn away fat deposits more quickly. Exercise increases your energy needs, so you'll break down more fat. It also helps you retain muscle tissue as you lose weight, which helps ensure that your weight loss comes mostly from fat. While you should push yourself to work out at a moderate to vigorous intensity to burn the most calories, that doesn't mean your workouts need to be miserable. Upgrade a brisk walking workout, for example, by choosing a hilly route or increasing the incline on your treadmill. Walking uphill at 3.5 miles-per-hour for an hour burns 408 calories for a 150-pound person, compared to just 259 calories burned walking on a flat surface. Once you've developed your cardiovascular fitness over the course of a few months, start adding high-intensity interval training, or HIIT, to your routine. HIIT workouts increase your metabolism after your workout -- an effect that can last up to 24 to 48 hours. Once you've warmed up, "sprint" by exercising at a high intensity for 15 to 20 seconds; then recover with a low-intensity 30- to 40-second interval, and repeat the sequence for 10 to 20 minutes. Complement your cardio with muscle-building weightlifting workouts. Weightlifting doesn't burn as many calories as aerobic exercise, but it prevents muscle loss as you shed pounds. That means the weight you lose comes from your fat deposits, not from muscle wasting. You can also incorporate short bursts of activity into your daily routine to increase your calorie burn and shed more fat. Park in the farthest parking space at work and use the stairs instead of the elevator, and take short strolls around the office a few times a day to slightly boost your activity. Sticking to a healthy, balanced diet can keep your metabolism revving. Eating throughout the day, for example, keeps you burning calories, while skipping on meals can lower your metabolism, making it harder to burn fat deposits, explains Illinois State University. Certain foods -- like processed and fatty foods -- take less energy to digest than whole, unprocessed foods, so they convert to fat more easily than nutritious foods. Swap processed white bread for less-processed whole-grain bread; eat brown rice instead of white rice; and fill your meals with generous servings of fibrous veggies. Make protein a key part of each meal; it takes the most energy to break down, so you'll burn more calories during digestion. Include white-meat poultry, fish, nuts, beans and pulses, lowfat dairy and eggs at your meals for quality protein. You may be tempted to try restrictive diets that promise double-digit fat loss each week or claim they'll melt all your fat deposits without much diet or exercise, but don't fall for it. These fad diets are impossible -- and usually very unhealthy -- to stick to, and they actually lower your metabolism, so you're more likely to add to your fat deposits when you inevitably "fail" and go back to eating normally. Certain fad diets -- such as those that cut out whole food groups, or limit you to a small selection of foods -- also increase your risk of nutrient deficiencies, which can make you feel too fatigued to get the activity you need to burn body fat.